Welcome to Creekside Quilting Newsletter! Well, Labor Day has come and gone and I hope everyone had a great weekend! 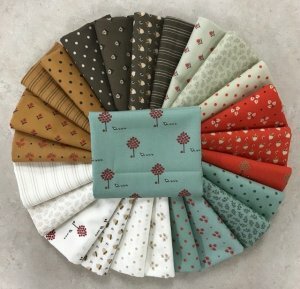 Here at Creekside, we are starting to think fall and just in time, comes the 101 Maple Street fabric line from Bunny Hill Designs. The fabric line has more of the muted fall colors and the accompanying patterns are darling for fall. There are 9 blocks in the main pattern, and there is the potential to at least have the quilt top done by Thanksgiving. What a festive decoration to add to your fall collection. 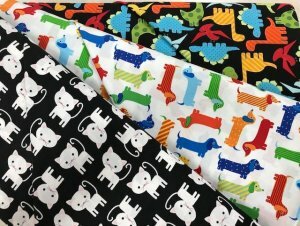 When these fabrics came in, Barb said, "Kitties, Hot Dogs, and Dino's...Oh My!" You will find them in our novelty section towards the back of the store. 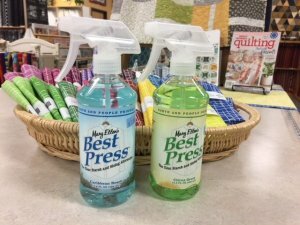 Mixing things up a little, we received new scents from Best Press! Caribean Beach and Citrus Green. Of course, you can always request a bottle of the old favorite, lavender! 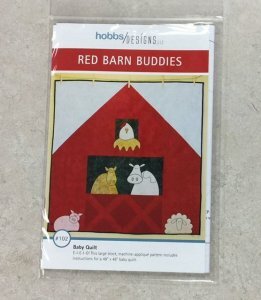 Christine Hobbs has a new pattern called Red Barn Buddies. Accurate Rotary Cutting on Thursday, September 6th in the evening 6-8 pm. Accurate Rotary Cutting is the recommended class for the Beginning Quilt Making Classes Session 1 being offered on Thursday, September 13th and Beginning Quilt Making Session 2 being offered on Thursday, September 27th, both 6-8 pm. Thursday, October 18th from 6-8 pm. Pat is another award winning quilter and her quilts are amazing. She is an excellent teacher and shares all of her knowledge with best practices, making her classes very beneficial. This series is a great way to get started with quilting! The Beginning Garment Making: Bondi Top Class is next Sunday, September 9th from 1-4. This class is taught by Tracy Feldmann, an officer on the Des Moines Sewing Guild Board and an Iowa State Fair Blue ribbon winner on a wide variety of items she placed in the Iowa State Fair. Tracy is a beautiful seamstress and an excellent teacher, filled with lots of knowledge and tidbits of suggestions to take a normal pattern and turn it into something amazing! Bagels and Stitches is Monday, September 10th from 10-noon. The classroom is open for your sewing projects, and I will provide the coffee and bagels to kickoff your morning! Wool Club is on Tuesday, September 11th from noon to 4 in our classroom! This is a fun group of ladies, and there is always room for one more! The Starr Pizzazz Table Runner taught by Rosella Hanson will be taught on Saturday, October 13 starting right at 10 am. Rosella is a certified trainer with the Tucker Trimmer and this class focuses on how to use the Tucker Trimmer Ruler. The quilt table runner is beautiful, and by the end of the day, you should have a new table runner top, just in time for Thanksgiving! Pattern, ruler, and kit can be purchased at the store. Scissor and Knife Sharpening will be available at the store on Friday, October 26th from 10:30 am-3:30 pm. Just in time for the holidays! The following machines are being closed out by Pfaff in order to make room for newer models. These prices are incredible! So whether you are buying a new machine, or one being clearance out, the Pfaff sewing machine will last you for years. Pfaff will still honor all warranties on a close-out-priced machine. At these prices, now is a great time to buy a new sewing machine! If we don't have one in stock, we are more than happy to order the machine for you. It's the Iowa v Iowa State football rivalry week and let's have some fun! When you stop into the store this next week (9/4-9/9), register for our give-away! We will be giving away 2 fat quarter bundles! The bundles will be a selection of either red and gold or black and gold fabrics, depending on which team wins this Saturday. Put your name in our jar according to which team you will be cheering for, and on Monday, we will be drawing 2 winners from the winning game day jar. Just a little fun to spice up the week of rivalry! Looking forward to seeing everyone in the store this week and don't forget your show and tells! Happy Sewing!